The epitome of vanilla Indie Rock are back with their follow up on 2015’s Happy People. Their second album was not as well received as their debut and you got the sense that a burgeoning ‘Indie 3.0’ had died an uneventful death in the space of two years. Now will they adapt or defiantly plod along with jangling riffs and slurred vowels? With their new single ‘Power’, you get the sense it is the latter. With the same rhythm sections of three and five years ago along with the same lost lyrics, they attempt to strike a expectant and triumphant feel in some attempt to believe their own hype. One notable improvement since their debut has been that their songs have been produced and presented a lot better, but you can only polish a piece of rust so much… we await a bright idea from Peace. Being compared to the likes of Nina Simone together with being classed as “the next Adele”, amongst several award nominations and triumphs, Laura Mvula’s successes came bounding like a peppy retriever playing fetch. And despite an apparent reminiscence of Back to Black in her debut Sing to the Moon, she parades a distinctive retro/pop/soul fusion unlike your typical BRIT nominee. This powerful exclusivity is once again explored in the glistening debut’s successor, A Dreaming Room. The album has a great degree of vibrancy that can either be comforting or disconcerting. The fluorescent toe-tapper Phenomenal Woman feels like a friendly hug, with up-beat and emboldening lyrics paired with cheery vocals. With such a seventies feel, you can imagine the backing singers jiving behind their mics to this on a past episode of Top of the Pops, and is a masterful finish to the album. Rival this to Bread: the merging of an off-centre drum machine and an odd rattling hook, alongside Mvula’s signature echoic harmonies acting as a weak attempt to gloss over the weirdness. These juxtapositions come to a dramatic climax in Kiss My Feet; the listeners are jerked to and from a Disney-like waltz and overpowering electronica. Lyrically the song is incoherent too – the opening lines state Mvula feels “lost and found at the same damn time” – so the whole track creates a swirling sense of confusion, for both the artist and the listener; I can’t decide yet whether its messy or pure genius. The longest track – Show Me Love – is the greatest advertisement of the London Symphony Orchestra’s impact on the album (apart from the pointless 46-second addition of Renaissance Moon). To some extent, the undulating flow of the harmonic strings steal the limelight from Mvula during this number, as she repeatedly sings the same words over and over again, almost as if it has been improvised. The tracklist is ultimately a blend of vitalising surges of pop and a hymn-like notions, extended by the LSO’s tender compositions. A Dreaming Room’s strongest asset is how beautifully personal it is. The track Nan is not a song at all, but a phone conversation between Mvula and her grandmother. This addition is especially touching – it’s impossible not to wear a smile whilst listening to it. The song People is sung with intense passion, as she and Wretch-32 explicitly discuss the treatment of black people. Not only does this song demonstrate how much of an influential figure Mvula is, but also establishes how she is both modern and unique. It’s fairly common nowadays to include a rap section in the final verse of a track, but instead of recycled lyrics bellowing over a recycled beat, the rap portion in People is layered with distorted swells of Mvula’s soft harmonies brawling with the force of Wretch-32’s from-the-heart lyricism. It’s both a fantastic song and a hugely efficacious symbol, as two vastly different musical powerhouses join to push for change. Weird but in the best of ways, Laura Mvula has produced an album that certainly lives up to expectations. Each track is a wonderful display of vocals that deserve to be flaunted at any given opportunity, and, although some tracks are less structurally successful than others, it’s clear that Mvula has put her heart and soul into every track, and for that, she can be forgiven for the long three- year hiatus. Birmingham’s Swim Deep are looking to move on from the cute psychedelia and Hanson aesthetic with their new album Mothers out on September 18th. Their debut LP Where the Heaven Are We made up for in production ability what it lacked in substance. They look to be channelling Kraftwerk and McCartney with their new single ‘Grand Affection’ and harnessing that ability in the studio with a song that is anchored around a bulky, synth beat with a echoed riffs and bass lines floating across it in much the same way Austin William’s vocals do. It’s a track that remains rather simple in terms of structure and perhaps still lacking a but of substance, but the delivery and presentation of something relatively simple is rather impressive as they open up and extend the boundaries of the tracks sound. A promising start for their new album. The Birmingham electronic group headed up by Trish Keenan were a band at it’s peak towards the end of the 90s and going into the 21st century, that were offering something a little different. They were not another Britpop group, but something a whole lot darker and sombre and something much more immersive if you. ‘Papercuts’ is one of them songs for me which is from their debut album entitled The Noise Made By The People from 2000. The song opens with a reverberating and distorted synth that creates an eerie and broken rhythm that is strung together by Trish’s tuneful and wistful vocal and by the bass line. The minimal features of the song are what makes it so wonderfully distant and it sets it up for Keenan’s vocal to take you by the hand and lure you in to somewhat unfamiliar musical territory. A wonderful song by a band that was never given the credit it deserved. I’m sure we would have had more different and intriguing music from them if it were not for Trish Keenan’s tragic death back in 2011. At the age of 42. Birmingham’s Swim Deep had talked of shaving their heads and going to war with their upcoming second studio album as they offer up a ‘new direction’ on their sound. The lead single ‘To My Brother’ certainly doesn’t sound like it’s on a linear course from their last album with more of a sonically charged piece of Madchester pop straight out of 1990. There is certainly a more expansive and sweeping nature to this track with the echoed and more mature vocals and the washing electronica. It certainly isn’t offering a new take or original perspective from the group, but it’s a slight improvement nonetheless. Don’t expect it to blow anyone away cause it won’t. 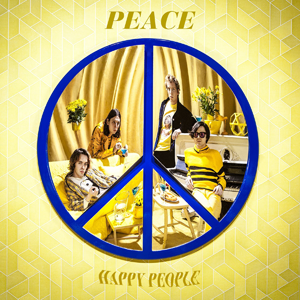 Peace are back with the follow up from their debut LP with Happy People. It’s an album that just has to be an improvement on the forced and cheap flamboyance of the half-baked In Love from 2013 and fooled no one with a memory beyond 2005. Whilst the album has suggested a degree of refinement which is what they need at the very least, expectation isn’t great for what they might produce with this effort. It’s reception will have far more personal ramifications than any general musical impact for they are in need of producing something less transparent and more meaningful in order to halt the gathering sense of ridicule that they are beginning to generate. With ‘Money’ you get a glimmer of substance and something towards creativity. I am only judging this from their own standard and not that of other artists, but there is tangible improvement here. The most noticeable is Harrison Koisser’s vocal, which is his own and not some put-on slur to be accepted by the hipsters. It easy and comfortable in it’s own skin and much more narrative of lyrics that are not trying to be something they are not. Musically, you can still pick out elements of Arcade Fire and Bowie and even Arctic Monkeys most recent guises albeit to a lesser standard, yet they are blended and mixed for a more hybrid sound of which the jangling guitars are largely ditched for a more solid rhythm with much more depth. ‘Lost On Me’ features clean rhythmic hooks as opposed to the predictable jangling riffs and serve a purpose along with Harrison Koisser’s vocals. These have improved by leaps and bounds now he’s dropped the slurred charade and projected his natural vocal. The transition from verse to chorus offers up a change of dimension rather than simply an instrumental alteration even if the chorus screams cheese filled pop. The lyrics are still pretty comical at times, but I guess it gets the younger kids into them. It’s by no means my favourite track by a millions miles, but there is a lot less to be bemused with than before so consider this song as the epitome of not bad. ‘World Pleasure’ falls upon a far lower standard. The track’s initial steps are exactly what you expect. The jangling, loose riffs and mis-matched percussion, the ‘rap’ or spoken verses are lifted straight from ‘West End Girls’ by The Pet Shop Boys and there is a slight sun kissed feel evocative of ‘Get Lucky’ from Daft Punk, yet both are far poorer versions. As is the blatant Madchester, Britpop and Noelrock replicas as the song pulls out of the instrumental. From all of this, it’s virtually impossible to take a scrap of substance from it. The title track has a fabric of instrumentals that are a flat-lining musically from what they’ve done numerous times before and by now it simply washes over you in a monotonous wave of jangling and that irresistible urge to churn out that vocal slur. ‘Perfect Skin’ has a gentle sonic tinge before launching into a Britpop flashback that certainly leaves an indelible mark in your head and the sing-a-long factor just about makes up for the lack of innovation and yet again, the questionable lyrics. For ‘Gen Strange’ see 1994. It would seem whilst the singles promised a little glimmer of something behind the façade or at least a sense of them trying, the result throughout the album is one that would only be successful if the last three decades had been erased from our minds. Unfortunately for them that hasn’t happened for many this album will be erased from our minds pretty soon as well. Peace have released a new single in recent weeks. A third from their upcoming second studio album to be release later this year. The other two have been pretty mixed affairs. ‘World Pleasure’ may as well have been called Perspex as it was so easy to see through, but ‘Money’ offered a glimmer of light. A hint of progress and originality. Now we have ‘Lost On Me’ which is quite alright to be honest. The rhythmic hooks as opposed to the predictable jangling riffs have purpose and Harrison Koisser’s vocals have improved by leaps and bounds now he’s dropped the slurred charade and projected his natural vocal. The transition from verse to chorus offers up a change of dimension rather than simply an instrumental alteration even if the chorus screams cheese filled pop. The lyrics are still pretty comical at times, but I guess it gets the younger kids into them. It’s by no means my favourite track of the year by a millions miles, but there is a lot less to be bemused with than before so consider this song as the epitome of not bad. Birmingham’s JAWS are set to finally release their debut album Be Slowly on September 15th after a smattering of tracks and an EP over the last year or so. They’ve also announced a set of dates that they have embarked on a few days ago and will finish by the end of September, so if you wish to get an early glimpse of Be Slowly then I suggest you get yourself there. Another idea of the album’s sound comes in the form of the release of it’s title track. A track that makes a sudden burst with a Cure evocative riff and feel and the song does well to maintain a set path of hooks and melodies while still being able to wash the song out through large amounts of echo and reverb. The vocals just about make themselves known but it’s the music that is guiding the vocal on this occasion. Any more positives, however are fleeting. It not only sounds similar to The Cure, but pretty much is The Cure and no amount of echo can change that. The echo itself is a cheap sort of add on thrown on in what can only seem to be some vague attempt to be ‘trippy’ for the festival season. It is by no means the integrated washed out and sonically charged bursts and waves of Tame Impala or other Kevin Parker productions. The vocals and dull lyrics fade into obscurity by how the could be a special delivery from Harrison Koisser or even Dan Smith and they are hardly worthy aspirators. I’m sure all the hipster kids will love it on their Ket or whatever but you shouldn’t need a drug to make something sound good and even then it doesn’t change the fact that this one is decidedly average as the once promising B-Town scene becomes a dreary and lethargic slog. The Birmingham electronic group headed up by Trish Keenan were a band towards the end of the 90s and going into the 21st century, that were offering something a little different. Not another Britpop group, but something a whole lot darker and sombre and something much more immersive if you like. ‘Papercuts’ is one of them songs for me which is from their debut album entitled The Noise Made By The People from 2000. The song opens with a reverberating and distorted synth that creates an eerie and broken rhythm that is strung together by Trish’s tuneful and wistful vocal and by the bass line. The minimal features of the song are what makes it so wonderfully distant and it sets it up for Keenan’s vocal to take you by the hand and lure you in to what unfamiliar musical territory. A wonderful song by a band that was never given the credit it deserved. I’m sure we would have had more different and intriguing music from them if it were not for Trish Keenan’s tragic death back in 2011. At the age of 42. Peace unveil their first proper single from their upcoming second LP and as you’ll know, I’ve had some harsh words to say about their sound and approach but I also wanted them to simply be creative. With ‘World Pleasure’ you could immediately see a worrying amount of taking and stealing from other tracks without any input from them which was the harrowing story of In Love for me and many other before me when you factored in the lyrics too. 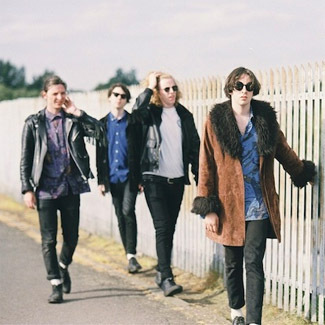 With their new track ‘Money’ though; you get a glimmer of substance and something towards creativity. Don’t get me wrong. I’m only judging this from their own standard and not that of other artists, but there is tangible improvement here. The most noticeable is Harrison Koisser’s vocal, which is his own and not some put on slur to be accepted by the hipsters. It easy and comfortable in it’s own skin and much more narrative of lyrics that are not trying to be something they are not. Musically, you can still pick out elements of Arcade Fire and Bowie and even Arctic Monkeys most recent guises albeit to a lesser standard, yet they are blended and mixed for a more hybrid sound of which the jangling guitars are largely ditched for a more solid rhythm with much more depth. It still isn’t perfect and by no means the best track I’ve heard this year by any stretch, but hey! I actually enjoyed this track and I’m praying that their upcoming LP is more evocative of this track and hopefully even more creative. Bet you weren’t expecting that were you?